Rocking a Winter Wonderland: Family-friendly Fun at Stowe's Adventure Center | Features | Kids VT - small people, big ideas! I'll never forget my first look, circa 1986, at Stowe Mountain Resort's most famous feature: the fabled Front Four trails of National, Goat, Liftline and Starr. I was quaking in my rear-entry ski boots as a young girl. But my daughter, now 9, will have a different memory. She'll never forget her first look at the resort's 40-foot-high Elephant Head Tower, riddled with handholds and footholds. It's as artificial as the Front Four are natural, but both are equally gnarly attractions. "People come in, and they can't believe it," said Peter Davis. He's the specialized recreation manager at Stowe Rocks, part of the sprawling new $25 million Adventure Center that's redefining how skiers and riders spend their off-slope time at the resort. "It really is the gateway to adventure at Stowe," he added. During my family's recent visit to the resort, we watched couples and groups of buddies gear up for the ZipTour Adventure and TreeTop Adventure. Those attractions have since shut down for the winter, but what remains open is just as lofty: a 30,000-square-foot lodge with big wooden ceiling beams, buzzing with winter activities. The Elephant Head Tower, named for a nearby outdoor climbing cliff at Smugglers' Notch, serves as the centerpiece of Stowe Rocks' climbing facility, which features nearly 50 routes on 20-odd top-rope stations. Auto-belays — devices that take up the slack for a climber, eliminating the need for a partner — allow the Adventure Center to accommodate slews of climbers. Kids as young as 18 months have taken to the wall, according to Davis. Two hours of climbing, including equipment and instruction, costs $26 for ages 12 and under, $30 for 13 and up. Private lessons are available, too. "We're introducing the sport to a lot of people who've never tried it before," Davis said. "So we've set a variety of different routes — very easy routes for never-evers and challenging routes for more experienced climbers." Dillon, my daughter, managed to scramble up Elephant Head in less time than it took me to whip out my iPhone for an Instagram shot. She was motivated not only by a sense of competition with her 8-year-old brother, Harper, but also by the instructor's encouraging words: "Don't slow down! You got this! You can do this! Keep bringing your feet up!" For his part, as soon as Harper finished one route, he was off to try another. A rapidly growing third grader, he often complains of hunger pangs, but Stowe Rocks kept his mind elsewhere. Had we needed more fuel, however, the Canteen upstairs would have come to the rescue. There, chefs hand-toss pizza pies such as the Big Pig, with meatballs, hot Italian sausage and ground beef; and the Off-Piste Pesto, with artichoke hearts, sun-dried tomatoes, olives and goat cheese. The Canteen also offers strombolis, salads, subs and frosted brownies to take the edge off a chilly day on Mount Mansfield and Spruce Peak. In addition to Stowe Rocks, the Adventure Center now houses Stowe's Ski & Snowboard School. The Canteen, just adjacent, can accommodate 420 kids and instructors sitting down for lunch at the same time. "There are very few purpose-built centers of this size in our business," said Stowe marketing and communications director Jeff Wise of the family-focused venue. "Stowe Rocks allows multiple generations to continue their active day together, while the Canteen provides great family food and drink." Wise added that the Adventure Center hosts kids' programs such as Climb Time — supervised evening activities that enable parents to enjoy some alone time. The Adventure Center is heated and cooled entirely with geothermal energy. A large-scale mural by Geoff McFetridge, former art director for underground Beastie Boys magazine Grand Royal, uses animal caricatures to highlight local points of interest. Visitors can peruse artifacts from Vermont's early skiing history in a Vermont Ski and Snowboard Museum installation. If those visitors don't own outdoor equipment, no problem: The Adventure Center also includes a Gear Zone rental area, a retail space, a concierge call center, a movie theater and a daycare center. The resort is doing its best to provide one-stop shopping for nearly every recreational need. It may also be trying to persuade people never to leave. The ice-skating rink right outside hosts broomball on Thursdays and offers free lessons for kids on Fridays. The resort has performances lined up this winter, too: For example, Olympic medalist Nancy Kerrigan will appear in a preholiday skating exhibition on December 17 and 18. I know Stowe's fabled Front Four will still call my name this winter. But other adventures might, too. When my kids clambered off the Adventure Center's climbing wall and pleaded, "Can we try it again?" my answer was easy: yes. A version of this story appeared in the November 16 issue of Seven Days. Got the bouldering bug? 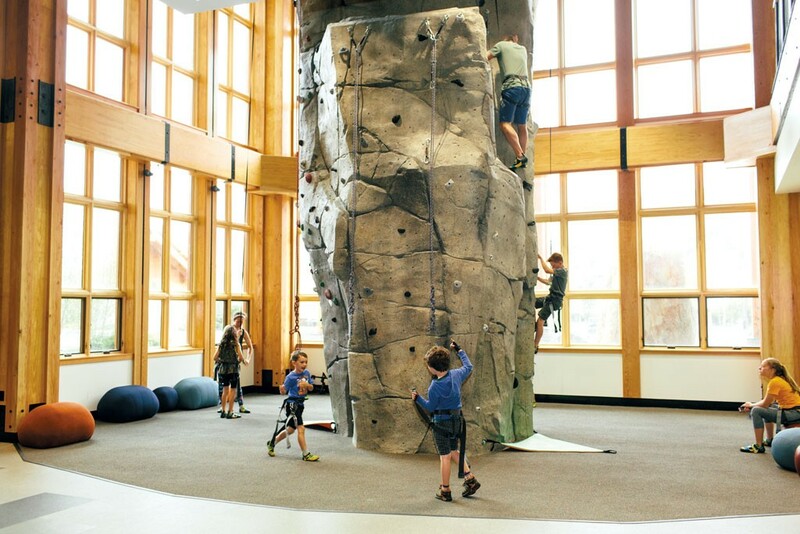 Here are four more Vermont climbing centers where families can rock out. This South End climbing gym hosts after-school classes, birthday parties and a Friday Night Kids Club, where parents drop off their littles from 6 to 9 p.m. for pizza, games and climbing. In the summer, it also offers Mountain Adventure Training day camps for ages 6 to 14 and overnight expeditions for ages 10 and up. 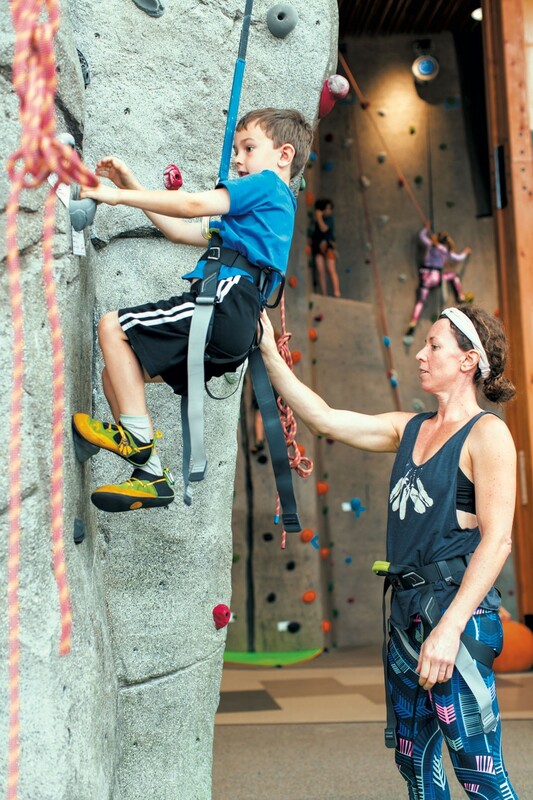 Parents can call ahead to set up a private lesson for their kiddos at this rock-climbing chain, which also operates centers in Boston and Brooklyn. On Tuesday mornings, MetroROCK offers a two-hour instructional program for homeschoolers. Summer camps and after-school classes are also available. You'll find outdoor rock and ice climbing walls, ropes courses, zip lines, a giant swing and more at this four-seasons recreational facility. Sign up in advance for a group outing, birthday party, or school vacation or summer camp. This center boasts 30- and 40-foot walls suitable for beginners and experienced climbers alike. It also hosts youth and adult birthday parties and a variety of summer programs for ages 7 to 16.